I suppose the title should be, “Painting Among Crocodiles,” since I didn’t use them as painting tools. Instead, I paint pictures of them and their habitat. 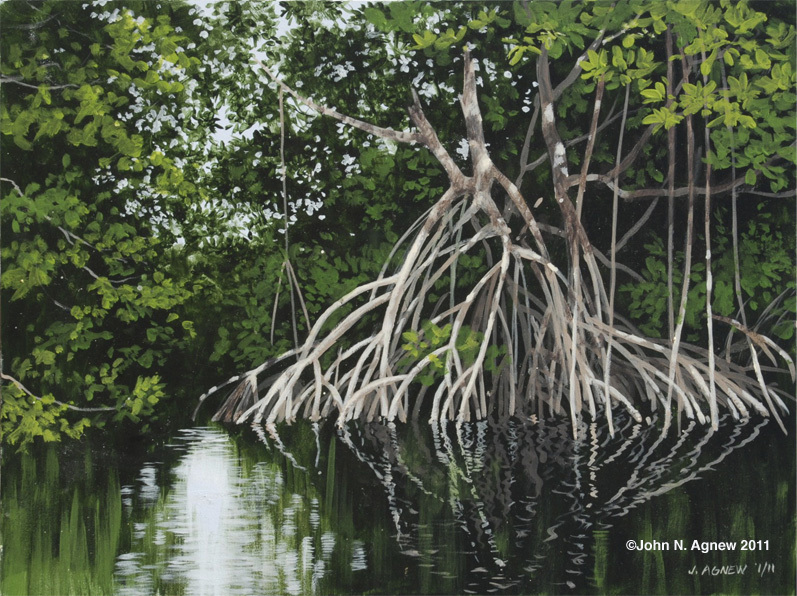 Last winter, I spent nearly a month in Everglades National Park as Artist In Residence. 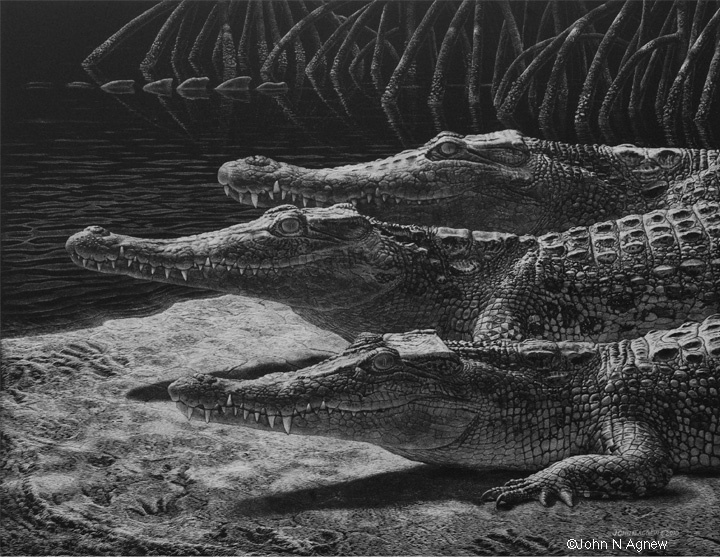 One of my stated goals was to paint and draw the American Crocodile (Crocodylus acutus), not to be confused with the American Alligator (Alligator misissippiensis). Both exist in the park, which is the only place in the world where you can see the two species in one place. 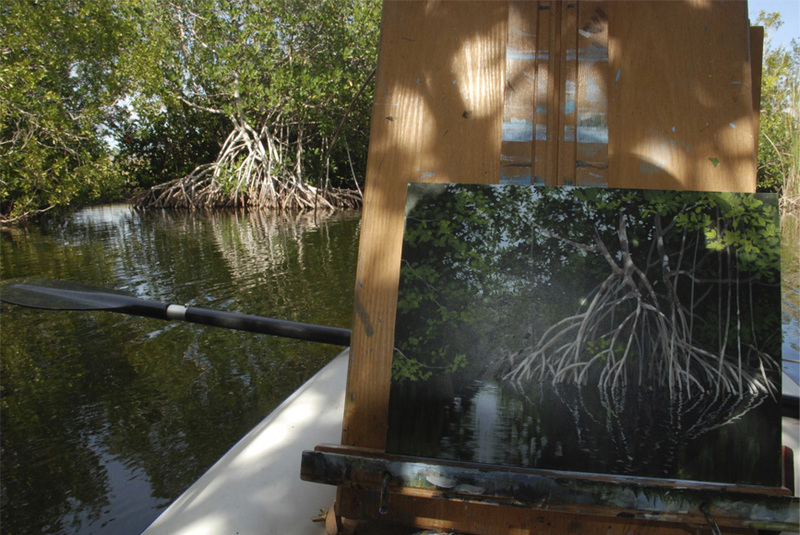 Painting from the kayak… the paddle is supporting the French easel, my pallette is in my lap.It’s a little tight, but comfortable enough. Crocodylus acutus does not have a reputation as a maneater, but it is still a powerful predator, well equipped to dispatch a soft, pink meal like myself. In my white inflatable kayak, I suppose I looked like a big marshmallow with a pink, chewy center. There are places in the world where I wouldn’t dare paddle around in such a flimsy craft with my body so close to the water. Saltwater crocs (Crocodylus porosous) and Nile Crocs are both very large species that would attack a mammal my size without hesitation. It’s been suggested that acutus just doesn’t normally have large mammals in it’s diet, so we don’t appear to them as a prey item. Nile crocs, on the other hand, have been filmed grabbing wildebeest and zebra by the nose, and tossing them over their back into the water. 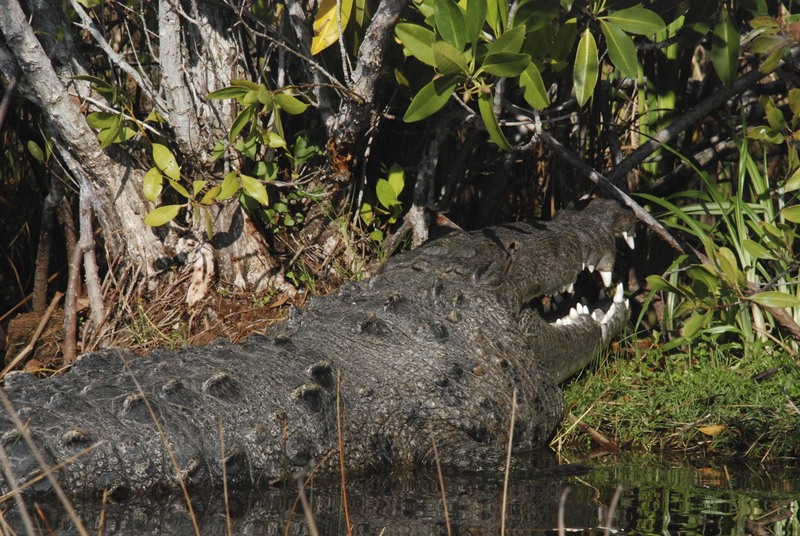 A well known kayaker and trip leader was taken by a Nile croc, right out of his kayak in the Zambesi River. 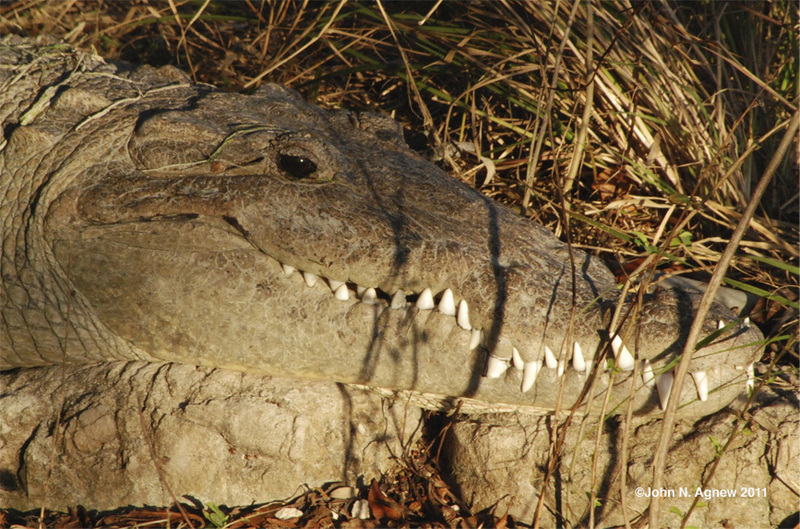 Saltwater crocs have been notorious as maneaters as well, taking people in southeast Asia and Australia with some regularity. Wonderful work! 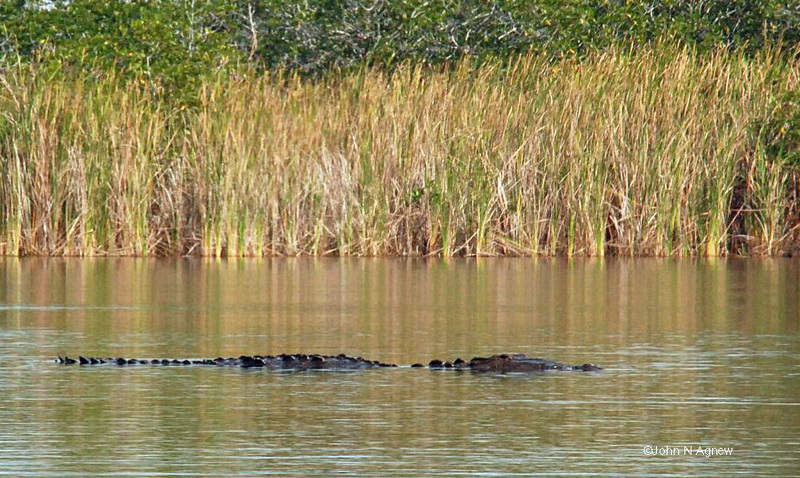 I’ve spent a good deal of time in Flamingo and the surrounding area filming and photographing both Crocs and gators. Unfortunately, some of my favorite subjects died during the cold snap few years back. I’ve been told that the croc at nine mile pond is in the 15 ft. range, that seems a bit bigger than you’d expect. They are remarkable animals however, big or small, and I can think of few places I’d rather be than in the Everglades with a camera. Keep up the good work, I really enjoyed it.